The New York Red Bulls II had to rally twice to earn a 3-3 draw with Toronto FC II at MSU Soccer Park. 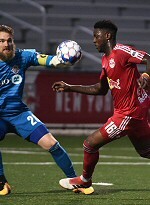 The Red Bulls II took the lead in the 12th minute when Anatole Abang latched onto a lifted ball in behind the defense by Niko de Vera, rounded TFC II goalkeeper Caleb Patterson-Sewell and finished from the left side of the penalty area. Toronto leveled in the 23rd minute as Tsubasa Endoh tucked home a close-range finish from Jordan Hamilton's low cross from the left to the top of the six-yard area. The visitors then took the lead in the 36th minute as Tim Kübel put home the rebound of a shot by Endoh to the right corner that New York goalkeeper Ryan Meara did well to keep out, only to be beaten by the second chance. Three minutes later, Ivan hit back for the Red Bulls II with a perfectly-placed finish to the bottom-left corner of the net. Toronto went ahead just past the hour-mark as Hamilton capitalized after a good turn by Matt Srbely opened the defense to create the chance. Brian White headed in his ninth goal of the season from a corner kick in the 68th minute to even the game.